Like many readers, I strive to finish books but, with so many wonderful choices and the proverbial, so little time, even accomplished authors like Hilary Mantel should not get a pass from the editorial department. Doing so is a disservice to faithful readers. Also, the cynicism of turning what should be a 300 page book into a 400 page tome, to justify the hardcover cost, does little to help what is supposedly a struggling publishing industry. In places, Bring Up The Bodies crawls along at a numbing pace. 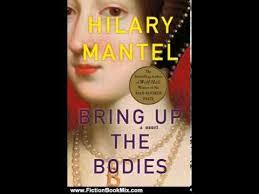 In one example, on page 255, Cromwell initiates a five page conversation with Mary Shelton (cousin to Anne Boleyn). Mary, a mature woman, gossips like a silly sixteen year-old trying to curry favor with the most popular and powerful boy in the class (Cromwell), by ratting on the poor girl (Anne Boleyn) who’s fallen out of favor with the in-crowd. As Mary details Anne’s couplings with most of the men at court, she is alternately coy, malicious, gleeful, flirty, achingly tedious and questionably truthful. With that said, Cromwell is brilliantly portrayed as a master manipulator whose mere presence often enables him to get the result he wants. He’s a Jekyll and Hyde character, a Svengali figure one moment, ruthlessly plotting an execution, then touchingly mourning his deceased wife and daughter. Cromwell behaves like a doting father, entreating King Henry not to hurt Christophe, his only surviving son when they joust in the upcoming tournament. Before he unleashes one of his deadly strikes, Cromwell can be the ultimate gentleman, capable of great tenderness and respect for all citizens, whether a nobleman, or filthy beggar. Henry, too, is more than a ruthless brute who fatally eliminates his no longer-useful wives. He is often fair, patient, caring and goofily romantic. Strong characterization kept me going on this book. Sweet Jane Seymour, queen-to-be, is naive, straight-talking, not much of a looker. Ex-queen Katherine of Aragon is dying in the tower, but with dignity. Anne Boleyn, who is on her way to the tower, is a toxic personality, petty, mean-spirited and hard to like. However, her sorrow and humanity rise to the surface when she miscarries and fails to produce a son for Henry. Finally, lest we forget, some of Mantel’s domestic scenes remind us that history repeats itself: “pale oak-panelled walls gleaming in expectation of paint.” “Pots of basil on the window sills;” festively decorated Christmas trees, or children wearing their angel wings for the Christmas pageant.